Biofuels are made from carbohydrates and fats in corn and other feedstock. This is a wasteful process because it leaves behind all the protein, a far more abundant substance. As a result, one of the big questions for alternative energy researchers is how we can pull biofuel from protein. Especially because proteins are also present in industrial waste products from agricultural processing - things like corn husks, for example. Imagine if you could take corn husks and turn them into gas. Well, now we're one step closer. James Liao and colleagues overcome this problem by changing metabolic pathways in E. coli. The engineered bacteria are able to efficiently remove nitrogen groups from amino acids — the building blocks of proteins — to produce alcohols, which in turn are converted into biofuels. 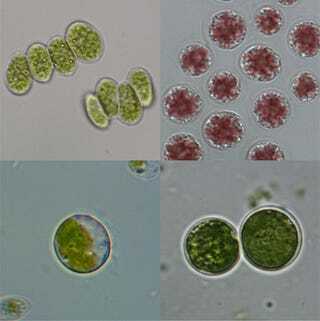 Many kinds of algae, like those pictured above, are also packed with proteins that these E. coli can turn into alcohol as well.